Whenever you are ready! We've now completed the refurbishment of the whole building and have installed the high speed internet and phone networks. All you need to do is let us know your requirements and sign a simple licence agreement. We'll then take you through our simple induction process and then you can move in. 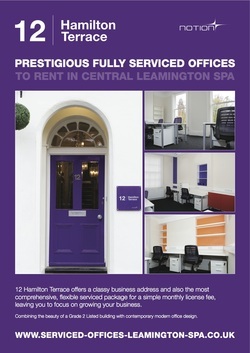 We've already had a lot of interest in all our available offices so come and see us before it's too late! Call us now on 01926 889885 to arrange a viewing. Does your 'All Inclusive Serviced Office' monthly package really include absolutely everything, including tea and coffee? Of course! Absolutely everything is included in your package and there are no hidden extra charges. All we ask is that you pay for your outbound phone calls. There is a long stay car park and free on-street parking a short walk from the building. Do I have to be a tenant to hire your Meeting Room? No! The Hamilton Room is available to hire by tenants and non-tenants, although tenants and virtual tenants benefit from a 20% discount. This room is an ideal space away from work, perfect for a local business in need of an interview room for the day. You can book The Hamilton Room by using our online booking system. An obvious and popular question. Our competitive rates will be discussed at the time of viewing. Please give us a call on 01926 889 885 to book a viewing. We work occasional weekends and evenings, are we able to access the building? Yes, you will be issued with entry and alarm fobs which will allow you access 24 hours a day. Your office will always be secure when you're not there, each fob is programmed to alarm specific offices.